Are these guys legitimate? Does anyone know? They seem to be. I think they are……..
Ummmm…well…they pocketed some of my money anyway. Desperate moment for me. I hope they are legit and onto something over there at SCD Lifestyle! They seem to be pushing to sell something (can’t even figure out all the books/e-books they’re offering). But there are A LOT of testimonials regarding how helpful they have been. A lot. When I search for “cures to chronic constipation” on-line, I take a look at the site, and if I see a sales pitch for a supplement or to buy something–I click the other way as fast as I can. (Almost always. Except this once.) I do not need another pill or supplement to try. Prescription or otherwise. Well, not until the colectomy is scheduled anyway. And hopefully that’s years of chronic constipation away. But in the meantime, I’ve pitched the aloe vera. Pitched the pumpkin seed oil. Pitched the Candida Cleanse. Shelved the molasses. Shelved the glutamine. Tossed the fiber. Shelved the vitamin C. Docusate was trashed a long time ago. Suppositories good for nothing except hemorrhoids. And so on and so on. Anyway, these guys called Steve and Jordan run the SCD Lifestyle website. I stumbled across them when I was researching the Specific Carbohydrate Diet for treating my lifelong chronic constipation. To put it way too simply, the Specific Carbohydrate Diet removes all grains, artificial colors, artificial preservatives, sugar, and certain starchy foods. Elaine Gottschall wrote the book, Breaking the Vicious Cycle, that the diet is based on. She then crusaded for the diet until she died in 2005 in her 80s, I think. Her story is moving. It moved me anyway. Guess that was the motivation for this blog. One woman, one child, and a realization that diet may just play a huge role in many illnesses, outside of diabetes and heart disease! Why isn’t the word about this getting out? Check out her story. It’s pretty cool! To make my long story short, I started the GAPS diet in June. You go through an intoductory food protocol and then you pretty much land on the SCD recommendations (isn’t this all so confusing?!). Once I got through the introduction and was eating more and more “legal” foods, I started having bowel movements! At first they were accompanied by cramps. I didn’t mind those cramps a bit. I was excited my gut was moving for once, even if it hurt! I figured it was my intestines waking up from the grave. To help the cramping matters, I cut back on the magnesium I had continued taking. Despite tapering off the magnesium, my bowel movements continued! I had bowel movements like I think they’re supposed to be! Once in the morning and then once again after supper! Soft. No straining. I was sure the diet had cured me! Before starting my blog back then to proclaim the miraculous glories of GAPS/SCD, I decided to be cautious and wait a bit. Just in case it was a fluke. In July, we made some strawberry shortcakes using almond flour. We had wanted to try goat’s milk on my middle child to see if it was a form of milk she could tolerate with her constipation issues. So we bought some goat’s milk for the strawberry shortcake. I couldn’t help myself. That biscuit topped with strawberries would taste so much better with milk on it. Just like when I was a kid! I poured some on. And MMMMMMMMM. It was so good. I had seconds and thirds. The next day I had diarrhea. Then I stopped. Nothing for days and days and days. I added and upped the magnesium. I added and upped the Miralax. I tried maxing out the vitamin C. I think there is a dose at which you must give up and say those things aren’t working. I tried the enemas. As long as something had moved around to the descending colon, the enemas worked and produced a bowel movement. Good enough for now. I retried the GAPS introduction diet to retrace my steps. No good. I tried the introduction again with high fat dairy like GAPS recommends. I made my own sour cream from farm-fresh milk. Made this GAPS constipation smoothie with egg yolks and sour cream. Absolutely no good. I tried my fresh yogurt in case maybe that would work. Just in case. No good. And with all of this dairy, the enemas stopped working. And I panicked. I googled and I googled. Then, I did something I never dreamed I’d do. Think of Grandma here. Watching her infomercials and ordering her new-found treasures. I bought the e-book from Jordan and Steve at SCD Lifestyle. I listened to them. I picked up some really good pearls. But, most of SCD/GAPS is not dealing with lifelong constipation. But more dealing with ulcerative colitis, Crohn’s Disease, celiac disease. People who usually have diarrhea or blood in their stools. I had nothing but stopped-up bowels. No pain to speak of. No alternating bouts of diarrhea and constipation. I think I have slow-transit constipation. Reduced peristalsis. Decreased enteric neurons. Decreased interstitial cells of Cajal. Decreased enteric glial cells. But I haven’t had the transit studies done. About the time I’d get in a panic over my constipation, I’d be pregnant or nursing or moving. GAPS introduction diet–I am taking this very slowly this time. I plan to wait no less than 4 days before adding the next recommended foods. I have been eating boiled meats/broths/veggies and two days ago I added egg yolks. I have seen no reaction, and I am feeling low urges for BMs, producing about 1-2 soft BMs a day. Get 60-70% of my calories from fat, preferably animal -based fats–this was recommended in Jordan and Steve’s e-book and reiterated over and over in the GAPS diet. But a bit challenging for me. Ick. Take 40 billion colony forming units (CFUs) of probiotic daily–I divide this into two doses on an empty stomach. I use the GI Pro Health brand recommended by Steve and Jordan: Scdophilus 3+. Yeah. I know. The bells are ringing in my head, too. Ding! Ding! Ding! You fell for it! $$$. Do Steve and Jordan get any kickback for GI Pro Health. I doubt it. Take Betaine HCL–I take 1-2 of these with at least two of my meals a day. I got a little burning at two. So I stopped there. Steve and Jordan say I’m low on stomach acid. I didn’t do their test. I didn’t buy their recommended brand. I already had my own brand from prior constipation experiments. Take digestive enzymes–Sucker. Bought the recommended GI Pro Health brand. I take two with each meal. Ching, ching, ching for GI Pro Health. And Steve and Jordan? Update 5/24/13: GI Pro Health uses an egg white derivative so I’ve dropped it. Fish oil–Steve, Jordan, and GAPS recommends this. I bought the recommended GI Pro Health brand. Come on. I was on the website. I might as well order it all at once! It actually tastes nice! I take this once a day. I think theres’ a recommended protocol by them for a really high dose decreasing over three weeks. But this dose seems to be doing nicely! Fermented Cod Liver Oil–Some vitamin A and vitamin D on top of the omega-3. Magnesium–Steve recommended magnesium glycinate or malate. But I have magnesium chloride and Calm (magnesium citrate) powder in my cupboards. So I’ll use these up. I was using three packets. Now I’m down to none over this week! Will keep watch of things. Don’ t want to get behind, if you know what I mean! 5/24/13 Update: I’m down to only taking this product called “Calm” (it’s magnesium citrate powder). See general surgeon today to see what he says. Tell him about my whacky diet. Good thing he knows my husband. Ask him to order the Metametrix 2105 as Steve recommended. And see if he’ll check my thyroid, too. The dairy I tried over the last three months always seemed to give me a huge setback from the baseline I was at. As for Steve and Jordan, I am grateful they offered some hope when I was so frustrated. If things keep moving for the next couple of months, I’ll be so excited and ready to proclaim their glories! You will know! 5/24/13 Update: Constipation is much improved, but I still have to take magnesium every night. Too much magnesium every night. I also take the lactobacilli probiotic and recently tried Prescript Assist probiotic. Can’t say the Prescript Assist made any difference at all. My GI tract certainly responds poorly to certain foods, including eggs, nuts, and dairy. My constipation is LOTS better than a year ago, responding to magnesium now. I still like to read SCD Lifestyle from Steve and Jordan. I think they’re very helpful, and I guess this is their job. They need to make money, and free advice doesn’t make money. 6/16/13 Update: Constipation still immensely improved from a year ago. Unfortunately, sometimes (don’t know why) this month, magnesium is not doing its typical job. Eggs in the Mother’s Day biscuits? I don’t know. I don’t know. Went on vacation and ran out of magnesium. Figured it’d be interesting to see if I could “go on my own.” Five days later, a few Bristol Meyers 1 type pellets was all I got. Still out of magnesium so I pulled out the Miralax, curious to see if it’d help more easily than before. Nope. Double doses on two consecutive days–and nothing. except more bloating. Made it to the Health Food Store to get more magnesium (and a few other supplements to see if I can please get off of magnesium), and things are returning to “my normal.” Will do a full update hopefully later this month. 5/1/14 Update: Things were going great by continuing on GAPS/SCD adjusted for my discovered food intolerances, probiotic, AND adding in a source of butyrate (beginning with butyrate itself and then transitioning to potato starch daily, which bacteria will manufacture butyrate from). I was able to taper off the magnesium and continue spontaneous daily BMs. Then I got pregnant and things have been crazy, up and down–but reliant again on daily magnesium. So I don’t know how long my success would have lasted, but pregnancy has definitely sent my GI back–but not as bad as any other pregnancy. This entry was posted in Constipation, GAPS and tagged Chronic constipation, GAPS, SCD on October 17, 2012 by thehomeschoolingdoctor. I don’t know about these, but have you tried YoungLiving’s Essential oils? Aromatherapy works wonders for almost any ailment you have ! No, I haven’t, but I have Aura Cacia essential oils: lavender, bergamot, and cinnamon. I like them a lot. They relax my mood but not anything else! But that’s worth a lot! Do you think YoungLiving’s would be better? And which oils do you like best? Yes, Jordan and Steve are totally legit! That’s cool! They seem to be amazing! Just too good to be true! But I’m glad! The world needs people like that! ha, I had to laugh at this because I am constantly wondering the same thing. I get their daily email and am always intrigued by the next product they’re pushing. 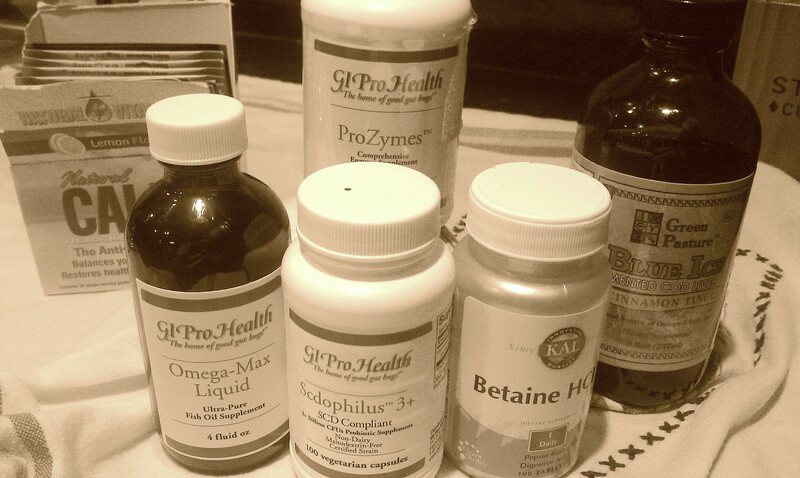 I am following SCD but haven’t tried the enzymes yet from GIProhealth. Are they still working out for you? Which supplement do you think is the best? I am reserving judgment still. I started egg whites two nights ago, and my bowel movements that were happening (triple “yay”)–stopped. Waiting to see what’s up. Was it getting lazy on my fat intake (yuck)? Was it lowering my magnesium dose? Was it the egg white? Who knows? I did, however, note that the digestive enzymes had egg white in them. That perturbed me a bit because eggs are a “dark horseman.” Why would they recommend a supplement with a “dark horseman”? Wonder if they know that. I should buzz over there and comment. I have not decided on my favorite supplements. About the time I get excited about one, it stops doing its job. When my bowel movements are regular for months, I hope I can figure out what helped me most.